If Buildings Could Talk to us… | BSRIA Blog - Opinions and insights from BSRIA Limited. Buildings are where we typically spend the greater part of our time, both at work, and often as not outside of it. They already consume about 40% of the energy used in most advanced countries. They represent a huge proportion of our investment, both as individuals and as a society. For centuries the technology of the day has been deployed to make them more efficient, comfortable and healthier for their occupants. The surprise is surely that it has taken so long for information technology to really move centre stage in our buildings. While smart homes remain, at least in most countries, a slightly geekish luxury item, many of us already spend our working day in environments managed by quite advanced building automation systems, which aim to maintain a safe, secure and comfortable environment. As building systems become more sophisticated, the more critical it becomes to be able to collect information about the state of the various components, and how they are interacting. 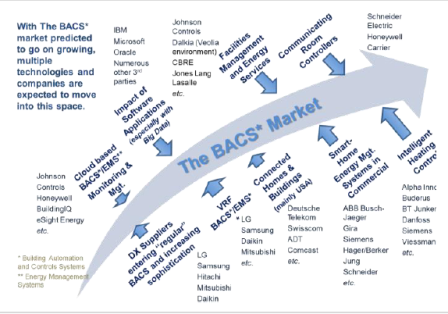 Accordingly, leading building automation and controls (BACS) suppliers, including Honeywell, Johnson Controls, Schneider Electric and Siemens have increasingly been making software available in order to process and make sense of this information. In this they have been joined both by some of the big enterprise software players, but also by a host of comparative newcomers. A key factor here is that the amount of data and the complexity involved can be quite large. It is easy to see that if you are in the position of managing a large portfolio of buildings, perhaps as a facilities management company, then if these buildings are automated then you may have to analyse a large volume of data to ensure that your estate is performing efficiently in terms of energy usage, costs, maintenance schedules, etc. What is less obvious is that even for a comparatively modest sized building, the data can be potentially quite complex. To get top performance from a building you need to look beyond the obvious. This means not just taking account of data from individual sensors or other information generators, but how these each interact with one another. For example, one surprisingly common scenario is where the temperature in a given zone is fine, but only as the result of a heating system and a cooling system battling each other to standstill, wasting alarming amounts of energy – and money – in the process. identify relationships and correlations. And once the “normal” patterns and correlations have been identified it can then look for anomalies, which may be a warning sign that something has gone wrong, or at the very least that something abnormal has happened. Why for example, might a temperature be spiking in one part of a building at an unexpected time? It is these kinds of challenges, as much as sheer volume that we are talking about when we refer to “big data”. Not only is this far beyond the capacity of the best human brain to process in any acceptable timeframe, it requires advanced analytical software to identify and prioritise the most important events, almost literally to “understand what your building is trying to say to you”. A whole range of suppliers are now active in this space, and some of them at least are likely to have a huge impact on how building automation develops going forward. 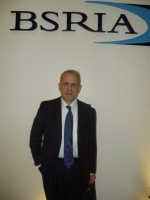 Here at BSRIA, in the latest regular update to our Hot Topic study on Threats to BACS Hot Topic for October 2013, we focus on this area, as well as taking a look at the implications of another, less fortunate, consequence of the growing importance of IT and software in the built environment: the spectre of cyber-attacks on buildings.